Internal Test of BA (Hons/Gen) 1st Semester Examination Admission Batch 2017 will be conducted as follows. Answer any two questions carrying 10 marks each. Time duration is 1 hour each paper. 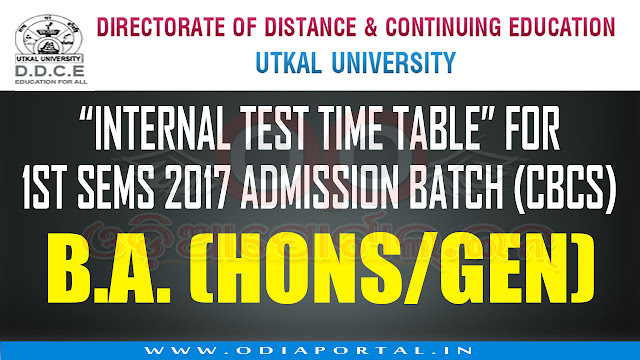 • The Internal Examination questions are uploaded in DDCE website www.ddceutkal.ac.in. 1. Report at DDCE, Utkal University at SAM on respective dates. 2. Carry your ID Proof (Adhara Card/ Pan CardNoter Card/ DL) for verification . 4. Details seat chart will be available at Directorate of Distance and Continuing Education. Utkal University premises. 9.00 AM TO 10.00 AM DSC 1.1: Economics, Education, History, Odia, Political Science, Sanskrit, Sociology. 10.00 AM TO 11.00 AM DSC 2.1: Economics, Education, History, Odia, Political Science, Sanskrit, Sociology.